So they made a sequel. The trend is such - if the Hate Stories and 1920s of the world can have sequels, why not Rock On? After all, the original was a decent movie, had a good soundtrack which some people still listen to, and fetched Arjun Rampal a national award as well (the jury is still out on that one though). Why not make a sequel and cash in on that? Why not, indeed! So how do you make a sequel? The first part was all about how a fallout between Joe Mascarenhas (Arjun Rampal) and Aditya Shroff (Farhan Akhtar) caused the band to melt, and how KD aka Killer Drummer (Purab Kohli) brought them back for a final hurrah. So for the sequel, the makers set out to have more angst. You already have your three lead protagonists - fill their lives with problems. So, to this end, we have Aditya aka Adi show up in a bearded avatar in faraway Meghalaya. He had moved there five years ago when a budding musician committed suicide because Adi didn't listen to his demo tape. Bearing the cross of guilt upon himself, Adi shifted to Shillong and is running a farmer's co-operative and a school. That his own wife and kid are in Mumbai is not much of a concern for our man. Joe is the successful owner of a club and also a judge on a reality show. KD is making jingles for ads but neither his clients nor he are happy with the work being done. He constantly keeps airing the thought that Magik should get back together and keep making music. Forget his friends, you yourself feel like slapping him for all the whining. Into this mix, the scriptwriters also introduce Jiah (Shraddha Kapoor), a talented singer and performer, who does not want her father to know that she is singing. The father is a famed classical music exponent who believes that his kind of music is the best and everything else is noise. Now Jiah wants to perform but she also does not want to upset her dad. So she's constantly angsty, too. The rest of Rock On 2 contrives to bring all these characters together and ends with the team organizing a concert for the benefit of the village in Meghalaya. The biggest problem with Rock On 2 is that all the angst shown seems manufactured. Adi, who we need to empathise with to be able to like the movie, is such a loser that when his wife finally tells him that they should call it quits, you are happy for her. What kind of a guy runs away from family and sets up a farm in Meghalaya leaving his wife to bring up their child all alone in Mumbai? And if when you're running a music label one of the artists who's given you a CD long ago (and who's also stalked you) commits suicide because you haven't heard it, and you blame yourself for it, good luck with running a company ...and your life. The writers also try to put in so much more into the script - issues in the North-East, corruption, politics and a million other things that take the focus away from the music. Which brings us to the music. Rock On had songs with nothing lyrics, but we had no qualms singing along. Rock On 2 has songs with all these supposedly deep lyrics about life and its meaning, but not one song is memorable. Farhan Akthar is screechier than ever, and he has company in Shraddha Kapoor this time. Shankar-Ehsaan-Loy deliver a big time dud, and that hurts the movie no end. The performances are uniformly dull, and you feel sad for Prachi Desai; just because she was in the first movie, you bring her back for a bit part with two scenes - not done. The film is however beautifully shot, and showcases Meghalaya in all its beauty. Rock On 2 tries to do too much and ends up doing everything in bits and pieces. Watch Rock On again or just listen to the songs - those won't cost you nothing (in this era of demonetization, that is supremely important), and will leave a nice aftertaste. Be the first to comment on Rock On 2! Just use the simple form below. fullhyd.com has 700,000+ monthly visits. 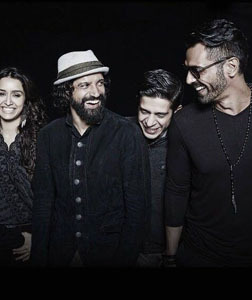 Tell Hyderabad what you feel about Rock On 2!